Houghton Mifflin Harcourt, 9780395977897, 368pp. To a degree both engrossing and alarming, the story of fast food is the story of postwar Amerca. Though created by a handful of mavericks, the fast food industry has triggered the homogenization of our society. Fast food has hastened the malling of our landscape, widened the chasm between rich and poor, fueled an epidemic of obesity, and propelled the juggernaut of American cultural imperialism abroad. That's a lengthy list of charges, but Eric Schlosser makes them stick with an artful mix of first-rate reportage, wry wit, and careful reasoning. Schlosser's myth-shattering survey stretches from the California subdivisions where the business was born to the industrial corridor along the New Jersey Turnpike where many of fast food's flavors are concocted. He hangs out with the teenagers who make the restaurants run and communes with those unlucky enough to hold America's most dangerous job -- meatpacker. He travels to Las Vegas for a giddily surreal franchisers' convention where Mikhail Gorbachev delivers the keynote address. He even ventures to England and Germany to clock the rate at which those countries are becoming fast food nations. Along the way, Schlosser unearths a trove of fascinating, unsettling truths -- from the unholy alliance between fast food and Hollywood to the seismic changes the industry has wrought in food production, popular culture, and even real estate. He also uncovers the fast food chains' efforts to reel in the youngest, most susceptible consumers even while they hone their institutionalized exploitation of teenagers and minorities. 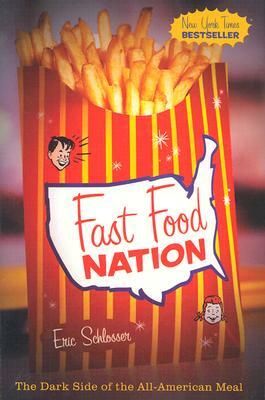 Schlosser then turns a critical eye toward the hot topic of globalization -- a phenomenon launched by fast food. "...Schlosser is a serious and diligent reporter..." "[Fast Food Nation] is a fine piece of muckraking, alarming without beling alarmist."